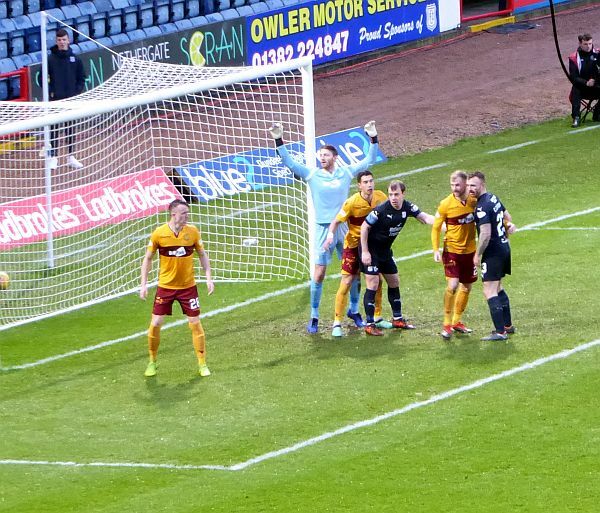 Motherwell extended their excellent record at Dens Park with a narrow 1-0 win thanks to a converted second half penalty by David Turnbull. We rode our luck at times but collect three points. It was hardly a convincing win. Dundee had by far more attempts on goal but their wasteful finishing cost them the game. The win puts us on a run of three consecutive league wins. It was no surprise to discover that the Motherwell team bus, having crawled through a 25 minute delay at the Friarton bridge, delivered the same starting eleven that had beaten Hibs in midweek. The away end looked sparse at the team ran out but travel delayed stragglers eventually made up numbers. There was little to involve either ‘keeper before the break. The best opportunities fell to Dundee but a display of awful shooting from the edge of the box left Mark Gillespie a spectator as the balls whizzed wide or high. Andy Dales had a couple of attempts but along with Martin Woods and Andy Nelson they failed the simple test of hitting the target. Motherwell had no such clear cut chances but there were a couple of moments when we might have opened our account. Gboly Ariyibi almost got a foot to a dink over the defence early on and Curtis Main turned and fired just beyond the post. Dundee pinned us back at the opening of the second period and Craig Curran had a header just wide from ma corner. Elliot Frear replaced Ariyibi in 53 minutes and within 5 minutes he earned a penalty. We had recovered from another Dundee attack and passed the ball all the way up to the opposition box. Main collected under pressure, moved the ball to the left and into the box. Frear was bundled to the ground by Inniss and Willie Collum pointed to the spot. David Turnbull lashed the ball into the net to give us a lead that was hardly merited. Deacon forced Gillespie into his first save of the game (remarkably) with a fierce drive from the right but our man was up to the task and conceded a corner.